This industrial lease form contains rental abatements (for minimum rent only) for a number of months to induce the tenant to sign the lease. The tenant must pay operating (direct) expenses during the abatement months. The lease is designed for an information technology tenant taking space in an upscale business park. Landlord is the owner of Pretty Good Business Park, an office, research and development and distribution park located in __________ County, __________ ("Property"). Landlord and Tenant have agreed that Landlord shall lease to Tenant and Tenant shall lease from Landlord certain space at ______________________________, __________, __________ and have agreed to enter into this Lease to evidence the terms and conditions of the leasing of space by Landlord to Tenant. Subject in all respects to the terms, limitations, conditions and agreements contained herein, the term of this Lease (herein referred to as the "Term") shall commence on the earlier of the date that the Tenant takes possession of any part of the Demised Premises or ___________ whichever first occurs, and shall terminate (unless extended as herein provided) at midnight on ___________. Landlord and Tenant each agrees to sign a statement confirming the actual date on which the Term begins (herein referred to as the Commencement Date) as soon as it is determined. If Tenant remains in possession of the Demised Premises after the end of the Term or any renewal or extension thereof with Landlord's consent but without a new lease reduced to writing and duly executed, Tenant shall be deemed to be occupying the Demised Premises as a tenant from month-to-month only, but otherwise subject to all the covenants, conditions, and agreements of this Lease. Subject to the general limitations of Section 4.01 and to the terms, limitations, conditions and agreements contained herein, Tenant may use the Demised Premises for the following purposes but for none other without Landlord's prior written consent: Information Technology Operations with related ancillary office and administration activities and for such other related businesses as Tenant may conduct from time to time. For the next _________ (___) full months, __________________________ Dollars ($________) which is $________PSF (hereinafter referred to as an "Adjusted Monthly Minimum Rent"). For the next ________ (___) full months, __________________________ Dollars ($________) which is $________PSF (hereinafter referred to as an "Adjusted Monthly Minimum Rent"). If the Term commences or terminates on any day other than of the first day of a calendar month then, the Tenant shall pay for the initial or the final partial month (being the period from the Commencement Date until the end of that month) a prorated Monthly Minimum Rent computed based upon the Monthly Minimum Rent specified above prorated for the number of days during such period. No Monthly Minimum Rent shall be due for the following months (collectively referred to as the "Abatement Months"): ______ (__) full months from the Commencement Date of this Lease. Tenant shall pay all Additional Rent for the Abatement Months. The entire Monthly Minimum Rent otherwise due and payable for the Abatement Months shall become immediately due and payable upon the occurrence of an Event of Default by the Tenant under this Lease. 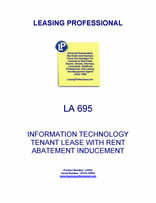 Within thirty (30) days after Tenant takes possession of the Demised Premises, and provided that there is not then an uncured Event of Default by Tenant on this Lease, Landlord agrees to pay to Tenant the following sum (the "Cash Inducement"), as an incentive to Tenant to enter into the Lease: (1) $______ (which is an amount equal to $_____ multiplied by the approximate number of square feet in the Demised Premises). In addition to any other remedies available to Landlord pursuant to this Lease or at law, if any Event of Default occurs that is not cured by Tenant within the applicable cure period, then Tenant shall, upon written demand by Landlord, reimburse to Landlord the amount of the Cash Inducement. Tenant hereby agrees to pay to Landlord with or prior to the execution of this Lease the sum of: _____________________ Dollars ($__________) (hereinafter referred to as the "Security Deposit"), which sum Landlord shall retain as security for the performance by Tenant of each of its obligations hereunder. Such Security Deposit shall be held, applied and refunded in the manner and subject to the conditions hereinafter provided. The Tenant agrees to pay to Landlord, as Additional Rent, each year, Tenant's proportionate share as defined in the next unnumbered paragraph of any Direct Expenses incurred by or accrued as an expense of Landlord or its agents on account of the operation or maintenance of the Building and all appurtenances thereto and including its proportionate share of any charges attributable to Common Areas, as hereinafter defined, and as such may be reallocated as provided hereunder, and an allocable portion of any and all other charges incurred by or accrued as an expense of Landlord in connection with the operation or maintenance of the Building. However in the cases of expenses which benefit portions of Pretty Good Business Park Business Park other than the Building, the portion allocated to the Building shall be based upon sound accounting principles adopted by the Landlord for the purpose of making a reasonable allocation. In the event that Tenant's use of services exceed its proportionate share of said services, Landlord may reallocate the cost hereof on a reasonable basis. Tenant's proportionate share of the total of all Direct Expenses allocable to the Building shall be calculated by dividing the total square feet of the Demised Premises stated at Section 1.01 hereof by an amount which is equal to the total net rentable square feet of the Building. Landlord represents that the net rentable square feet of the Building is _______________________ (_______) Square Feet. Notwithstanding the foregoing, in the event the usage of any utility, equipment or other Direct Expense by Tenant shall be determined by Landlord to be disproportionate to the amount of space leased by Tenant, the Landlord reserves the right to make an allocation of such Direct Expense to Tenant based upon actual usage by Tenant, as determined by Landlord in its sole discretion. Tenant agrees to pay such specially allocated amount in the event Landlord determines such usage is disproportionate and so advises Tenant. 10. Costs to repair latent defects in original work. If the State of __________ or any political subdivision thereof or any governmental or quasi-governmental authority having jurisdiction over the Building, should specifically impose a tax, assessment charge or fee or specifically increase a then existing tax assessment, charge or fee, which Landlord shall be required to pay, either by way of substituting for said real estate taxes or assessed against the Building, or in addition thereto, or impose an income or franchise tax or tax on rents in substitution for a general tax levied against the Building or in addition thereto, such taxes, assessments, charges or fees shall be deemed to constitute a real property tax hereunder to the extent said taxes are in substitution therefore or in addition thereto. A copy of tax bills or assessment bills submitted by Landlord to Tenant shall at all times be sufficient evidence of the amount of taxes and/or assessments levied or assessed against the property to which such bill relates. Landlord's reasonable expenditures for attorney's fees, appraiser's fees, consultant's fees and other costs incurred during the Term of this Lease without regard to the tax year involved, in any efforts by Landlord to minimize ad valorem personal and real property taxes, and other governmental charges, which rights are reserved to Landlord, shall be included in the definition of ad valorem real and personal property taxes and other governmental charges for the purposes of this Section. If Landlord should receive a refund of any such taxes or charges, the Tenant will share proportionately in same, after deduction for all of Landlord's expenses in obtaining any such refund. Landlord's and Tenant's obligations under this Section shall survive the expiration of the Term of this Lease.